Just do the talking! This is the next big thing in the internet revolution worldwide. Voice search is pacing up with amazing inventions like Alexa, Google Home, Siri, and Google Assistant to simplify our lives. We hear a lot about ‘voice search’ lately and the trend doesn’t seem to disappear. But does it have a significant impact on how to plan SEO strategies? It surely does. To stay in the top of the game this should be included in the primary SEO strategies & tactics. Tiny screens and even tinier buttons can be difficult to navigate — voice search is easier. Google has seen the ratio of voice search growing much faster than text search. Today, Google’s speech recognition error rate is only 8%, down from ~25% just two short years ago. Currently, the survey suggests that nearly 33% of searches are through voice search and it is increasing alarmingly. 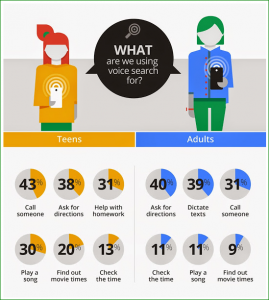 ComScore estimates that by 2020, a full 50 percent of all searches will be by voice. So are you willing to lose out on the half of the visits due to lack of Voice search optimization. What are people using Voice Search for? People type less but they tend to talk a lot. Simply putting it, one would type in ‘car insurance’ but on voice search, they are more likely to ask questions like ‘cheapest car insurance with lowest deductibles’. Tools – SEMrush, Keywordtool.io, Google Keyword Planner, Google Trends and Ubersuggest – will help you find out long-tail keywords. Search queries from the Google search console will help figure out long tail keywords that cater to your website and can be used potentially for a better CTR. Schema Markup tags have never been more important than now. The reason being voice queries with specific questions like “Hey Siri, find me the contact number for Pizza Place” can be easily catered to by SERP because of schema tags optimization. As an example, for local businesses, one can add tags like “currenciesAccepted”, “openingHours” or “paymentAccepted” in the code. If you own a restaurant or a food joint, you can add tags like “menu” or “servesCuisine” to your code. So whenever someone asks “Ok Google, direct me to the nearest Chinese restaurant”, Google knows that you serve Chinese food and your restaurant will be easily seen in the top results. When asking questions to a digital assistant, people tend to ask ‘why, where, which, what, how’ questions. Answers to such queries should be easily available on your FAQs page. Tools like answerthepublic.com are very useful to cater to such queries. This tool can give all possible queries that can be used with a particular keyword. Voice searches are of conversational nature and hence, it is more important to optimize for conversational long-tail queries along with keyword phrases. Queries like “Ok Google, where is the restaurant closest to my location?” are trending. It is best for local businesses to optimize for such queries. Most of the search engines have adapted to voice search functionality now. Google Maps, too, supports voice search on mobile devices. Similarly, YouTube has also jumped on to the voice search bandwagon. Digital Personal Analyst – What to expect in next few years? Gone are the days where talking to your devices was only shown on screen (Star Wars)! We have entered an era where having a digital personal assistant will be more common than having a physical personal assistant!